When was the last time you had a flu or a cold? 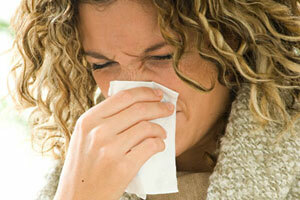 Do you live with allergies like chronic cough, asthma or eczema? Consider that all “diseases” are part of the body’s way of adjusting an imbalance. When we get a cold, flu or have allergic reaction, our body is trying to get rid of toxins by creating more mucous and elimination. Have you noticed we often get sick after the indulgent winter season or during seasonal changes? Symptoms like coughing, runny nose, fever (enzymatic actions increase when body temperature is raised) are all part of what our body immune system’s response to adjust in order to restore balance. And with chronic conditions like allergies, it’s because our immune system has become over sensitive after being under attack for too long… and from what…? The two most common foods that irritate our immune system are dairy and refined sugar. Gluten (found highest in wheat) is becoming more of a problem now with GMO. Other foods that put stress to our immune system are stimulants like coffee and strong tea, and alcohol (which turns into sugar). And in general, all processed foods are offenders to our immune system. Too much animal products (or in fact any food) can cause chronic inflammation, which is our immunity’s response to offenders. Inflammation promotes an acid and toxic environment in our body. This is not considering the toxic load we are bearing from our environment and food supply etc, and our emotional and mental stress that produce toxic stress hormones. Imagine, if we have not allowed the body’s detoxification and elimination system to be clogged up in the first place by compromising our diet and lifestyle, we do not need to suffer through these annoying symptoms, or more serious ones for that matter. Getting sick is not unavoidable – even though half of the people in your office/ your kid’s school is sick and coughing and sneezing right in your face! That’s why the best way to strengthen your natural immunity so that you do not get sick easily (or recover fast if you do) is to facilitate appropriate detoxification, and incorporate it in your day-to-day life. Conversely, the best way to ensure you WILL have recurring allergy attacks, colds and flus and other diseases is to take a “quick fix” approach and suppress symptoms every time they show up. For example, what would you do when you develop a fever? In the old days, our grandma would have told us to sweat it out. In fact in today’s world we can assist the body’s own immunity by having an infra red sauna session or taking a nice warm bath before your body had to develop a fever. Your grandma has been right in making sure you drink lots of water and covering you in layers of blankets. Doing these will be working WITH the body, instead of trying to stop your intelligent body in doing what it needs to do. White sugar creates an acid environment. Bacteria strives in an acid environment. Infection feeds on sugar. (So avoid white sugar, reduce or avoid white carbs, and of course alcohol.) Sugar weakens immunity. Okay this is obvious! The body heals and repairs while you rest. One hour of sleep before 11pm is worth two hours after it. Take time to relax. Have a massage or do whatever that brings you to the relaxed mode – as that triggers healing. Update in 2014: I now use anti-microbial and immune boosting essential oils in my massage – either apply myself on my feet or my back as a quick self care procedure before bed (which promotes better sleep too when I do it at night), or I receive a full therapeutic massage that almost always knock me out halfway… especially when the hot stones are used! (I receive this treatment two to four times a month.) The snooze I get is extremely deep and regenerative. It’s my emergency pick-me-up that takes away that “sickly feeling”. 4. Eat fresh garlic – garlic is antibacterial, antiviral and anti-fungal – what about putting chopped garlic in your vegetable dishes? 1 to 2 cloves is all you need and it’s much more effective than garlic pill. If you do not like the taste of garlic, you can also try this garlic juice (on empty stomach). 5. Increase antioxidant intake – eat more fresh vegetables which are rich in antioxidants (organic preferred). All superfoods are high in antioxidants. Make sure you have them in your diet. 7. Have regular exercise – increase blood flow and circulate your immune cells around the body better. Do it when you are healthy to prevent getting sick. If you are sick already, do “passive exercise” like cupping, scrapping, lymphatic massage, far infra red sauna – all of which move your lymph and blood without creating more free radicals. Drink more especially if you have fever. 9. Reduce or avoid gluten-containing food – avoid or reduce bread, pizza, and wheat containing food as they make your gut environment acid and promote mucous and population of unhealthy gut flora. Read my other posts on Natural Antibiotics which contains information about controlling air borne bacteria and virus and natural and potent alternatives to pharmaceutical drugs. Check out this post about flu shots also. Click here about recovering from flu faster. Previous What do you want your health to do for you?